Ocean’s 8 doesn’t arrive until next summer, and yet it has already brought so much coat-related joy to this world — thanks to production photos, a first-look photo, and now a new poster. 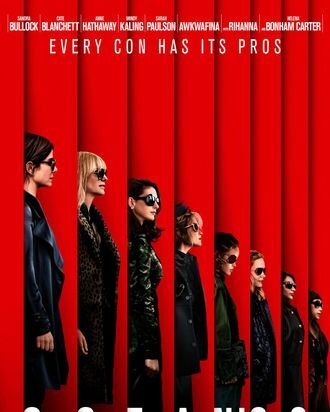 The film’s an all-female Ocean’s 11 starring Sandra Bullock, Cate Blanchett, Anne Hathaway, Helena Bonham Carter, Rihanna, Sarah Paulson, Mindy Kaling, and Awkwafina. Here they all are standing in a nebulous red space like the world’s most well-dressed fractal (the film’s costume designer is Sarah Edwards). Gary Ross (Seabiscuit) directed the film, which arrives next summer. It is frankly rude to make us wait.